Could borscht be the best soup ever? My earliest memories are of a restaurant version somewhere: treacly sweet and garishly red. No thank you. The soup we made in our food appreciation classes last week, in contrast, groaned with all sorts of vegetables and a depth of flavor that only hinted at beets. I’m convinced that the borscht we’re most familiar with–that shockingly red beet puree–sprang from the imagination of a restaurant chef. I found nothing of the sort in my primary source–Please to the Table–an award-winning collection of recipes and food lore from the former Soviet Union. 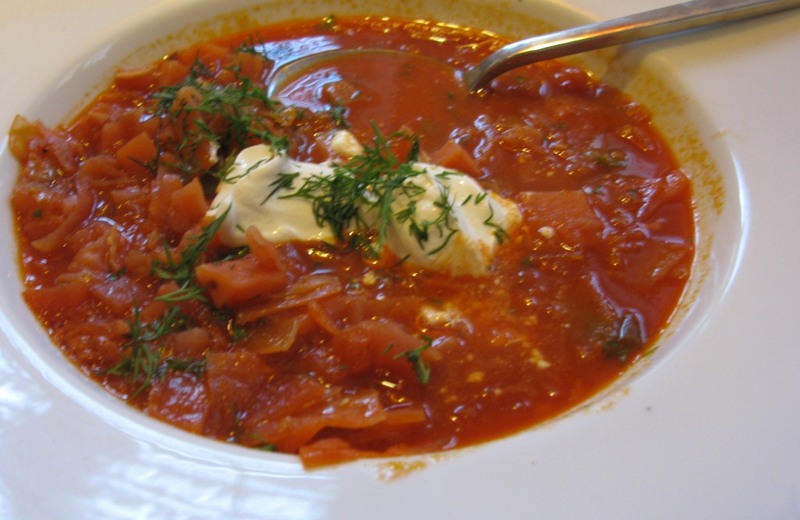 In fact, the author’s first version of borscht–a traditional Ukranian soup–starts with pork or ham. We made the vegetarian version (except for the chicken stock). Sure, it was red. But it was also so much more. The kids were crazy for it, asking for second and third helpings. How many other ways do you know to get children to salivate over cabbage, carrots, green pepper, celery, tomatoes–and, yes, beets. Normally my recipes describe ingredients as part of the narrative. But there are so many in this soup, I will list them first. In fact, the most difficult part of this soup may be shopping for the ingredients. Maybe the best plan is to make a large batch and freeze some for later. Melt the butter in a heavy soup pot over moderately high heat and add the onion, carrot and green pepper. Cook until the onion is soft, about 5 minutes, then add the cabbage, beet and celery. Cook a few minutes more, stirring frequently, then add the apple, potatoes and garlic. Stir in the tomato paste and mix well, then add the chicken stock and the bouquet garni. Bring the pot to a boil, then lower the heat and cook 25 minutes, or until the vegetables are cooked through and the soup is quite aromatic. Remove the bouquet garni and stir in the paprika, salt, pepper, sugar and lemon juice. Ladle the soup into large bowls (this soup does not need to be piping hot) and garnish with chopped dill. Serve with a sour cream on the side. Kids are not wildly enthusiastic about sour cream. But what do they know. In my opinion, borscht is best with a big dollop of sour cream in it. Our family loves borscht. Our version is similar to your recipe but with stew beef and about double the beets. Stirring that dollop of sour cream into it turns it a gorgeous pink! It would be more accurate to call the soup you describe a Svekolnik, which is simly a soup with beetroots. Borsch involves using a ‘nastoy’ or infusion, which is mainly beetroot kvass (fermented beetroot infusion), and usually uses a rich beef or ham bone stock (which you mention as per the original recipe), or a vegetable or mushroom broth in lenten times. The only type of Borsch with chicken broth is the Poltavsky Borsch, which also involves chicken or duck meat and dumplings. P.S. Its the spelling gestapo, ve vant your papers! It’s Borsch, not Borscht. I don’t mean to be nasty or anything, just pointing it out. I don’t know who started it, but the misspelling has even made its way into books I’ve seen! It’s a mystery to me where this ‘t’t comes from, but most certainly not from a soup kitchen…:-)!